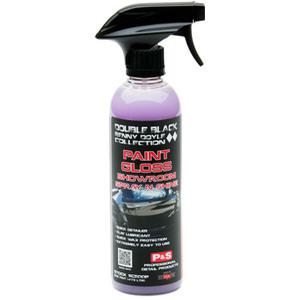 Renny Doyle Double Black Paint Gloss Showroom Spray N Shine is a quick detail spray that removes minor imperfections from your paint’s surface while also adding gloss to the finish. This quick detailer easily removes dirt, fingerprints, dust, and smudges to make your paintwork look freshly detailed. It contains a high amount of lubricants to ensure that you can safely wipe those imperfections. The slick lubricants also make this product the perfect clay lubricant when you come to decontaminate your vehicle. The slick spray ensures there is no marring. Renny Doyle has been a titan in the detailing industry for over 25 years. All of the products in the Renny Doyle Collection by P&S are endorsed by the legendary detailer himself. Apply in a cool, shaded area while your vehicle’s paint is cool to the touch. Simply spray Renny Doyle Double Black Paint Gloss Showroom Spray N Shine onto a small area, then wipe the product off with a clean, dry microfibre towel. When using Renny Doyle Double Black Paint Gloss Showroom Spray N Shine as a clay lubricant, make sure to use a generous amount of product to ensure proper lubricity.